There was a time when the only thing that could be recycled were plastic bottles and newspapers. As technology improves, so does the opportunities to recycle a lot more. Things like glass, asphalt, tires and lumber can all be ground up and repurposed. You can apply that same principle to many things you want to get rid of around your house including a big appliance. 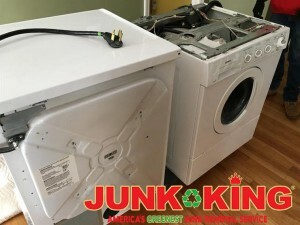 You might not know where to take a big appliance for recycling but a company like Junk King Minneapolis certainly does. Junk King Minneapolis was founded on the principle of recycling. Whereas other junk removal companies take the easy way of disposal by just dumping everything into a landfill, junk King Minneapolis makes the effort to avoid the landfill. They’ve set up working relationships with many recycling facilities throughout the area. Each one of these centers specializes in a different form of recycling. There’s one for e-waste, one for scrap metal, one for foam and even one for dirt. Where would your big appliance and up? You actually don’t have to worry about that. Just leave that test to junk King Minneapolis. The crews working for Junk King Minneapolis also have a lot of experience maneuvering these types of items down narrow hallways and staircases. They never want to leave a mark. They have a pretty good track record of accomplishing that goal. Although one man can usually load up a stove or washer onto a dolly and carry it out, and actually helps to have two workers on the job. That is exactly what you get when you hire Junk King Minneapolis. How you put them to work is entirely up to you. Along with your big appliance removal, you can ask the crew to bring up an old futon from the basement or remove a dresser from an upstairs bedroom. While there added, they can go into the backyard and take down the swing set. There’s just no limit to what the Junk King crew can haul away. It works for your schedule, you can set up your big appliance removal on the same day that your new model is being delivered. That way your kitchen won’t miss a beat. Handle big appliance recycling and junk hauling the right way by putting Junk King Minneapolis on the job from the start. This entry was posted in Minneapolis Appliance Disposal and tagged appliance, Junk King, junk removal on October 22, 2017 by Junk King. Last updated October 22, 2017 .